Performers include: Patrick Warburton, David Burke, Liz Vassey, Nestor Carbonell, William Newman, Matt Champagne, Leanza Cornett, Diana Morgan, Dan Sachoff, Jack Armstrong, Maury Ginsberg, Charley Rossman, and Scott L. Schwartz. In this superhero-spoof, the mysterious blue defender of justice, The Tick (Patrick Warburton), patrols and protects The City to the best of his dim-witted ability. His sidekick is the nebbish, moth-costumed sidekick Arthur (David Burke) who gave up his job as an accountant to pursue his lifelong dream of being a superhero. They’re joined in their fight against evil by Latino lothario-wannabe Batmanuel (Nestor Carbonell) and buxom beauty Captain Liberty (Liz Vassey), the government’s most powerful weapon against super villains. 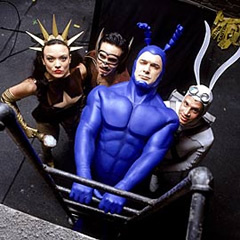 The series is based on The Tick comic books.